Deepening student understanding and purpose, expanding innovative thinking, and promoting excellence in character and in work. Give to Hayden Canyon Charter. 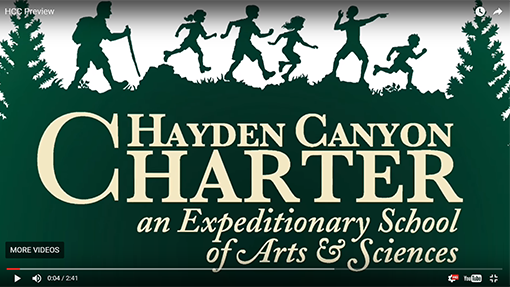 Hayden Canyon Charter is dedicated to achieving breakthroughs in academic excellence and character development by inspiring passion for inquiry and life-long learning utilizing hands-on discovery, real world application, collaboration and community; preparing each student for engagement in productive, thoughtful citizenship. What’s Happening at Hayden Canyon? The lottery drawing for the 2019-2020 school year will be held March 13, 2019 at 12:00 pm in the unit just to the South of the Hayden Senior Center. The drawing is anticipated to last approximately 30 minutes. Hayden Canyon Charter is accepting resumes for an open board member position. If interested, please send your resume to info@haydencanyoncharter.org before 7:00pm on Wednesday, February 27, 2019. Hayden Canyon Charter is accepting resumes for a volunteer interim clerk. If interested, please send your resume to info@haydencanyoncharter.org before 7:00pm on Wednesday, February 27, 2019. The Hayden Canyon Charter Board Retreat will be January 11, 2019 from 9am to 3pm at Spoelstra Family Chiropractic. This meeting is open to the public. HCC will be open to all students on a space-available basis. No student will be denied admission based on ethnicity, creed, gender, disability, or place of residence. With the exception of those who attend full day kindergarten, in-state students will not be assessed tuition rates. Out-of-state students will be assessed tuition rates based on the cost of education at HCC, minus funding (if any) available to offset the cost of education for out-of-state students. Achieving breakthroughs in academic excellence and character development by inspiring passion for inquiry and lifelong learning – utilizing hands-on discovery, real world application, collaboration and community; preparing each student for engagement in productive, thoughtful citizenship.